Break-even analysis finds break-even volume by analyzing relationships for fixed and variable costs on the one hand, and business volume, pricing, and net cash flow on the other. Business people calculate break-even point to find the number of product units they must sell to cover costs. What is the break-even point? What is a break-even analysis? Break-even point usually means the business volume that balances total costs with total gains. At break-even volume, in other words, total cash inflows equal total cash outflows. At Break-Even, in other words, net cash flow equals zero. How many product units must we sell to Break-Even? How many rooms must we rent to cover costs? At what unit sales volume do we earn a profit? The term Break-Even is a verb, as in "When do we Break-Even?" The form break-even is an adjective, as in "The break-even point." However, it is also correct to spell the adjectives as Break-Even or breakeven. In the simple analysis, Break-Even is the quantity (unit volume) that balances total costs with total gains for a net cash flow of 0. 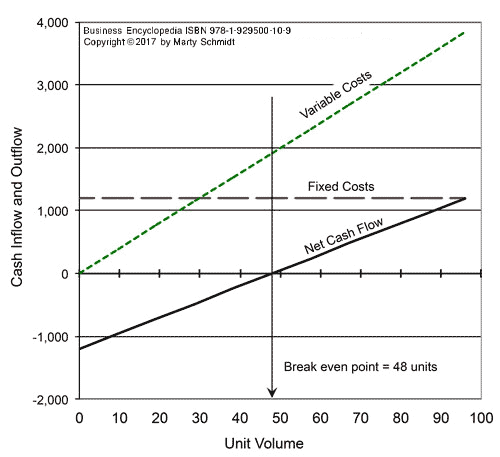 The break-even quantity depends on at least three variables: "Fixed cost," "variable cost per unit," and "revenues per unit." Break-even analysis attempts to find break-even volume by analyzing relationships between fixed and variable costs on the one hand, and business volume, pricing, and net cash flow on the other. Understanding how these factors impact each other is crucial in budgeting, production planning, and profit forecasting, And, break-even analysis, is central to this understanding. The simple analysis assumes that each unit brings the same cash inflow. For sellers, cash inflow per unit is the same as the selling price per unit. Fixed costs remain fixed, or constant, regardless of unit volume. For example, if the floor space expenses, manager's salaries, and janitorial services, do not change with unit volume, they are fixed costs. These costs vary in direct proportion to quantity sold or unit volume. Variable costs for selling goods, for instance, might include the "direct cost" the seller pays to acquire each unit. As a result, the total variable cost can be "cost per unit" multiplied by the unit volume. Semi-variable costs are constant across a range of business volumes, but change when that volume goes out of range. Wages for a call center operator, for example, might be a fixed cost when daily call volume is between 0 and 100 calls per day. A second operator might be necessary when call volume is 101 to 200. And, a third might be required if daily call volume is 201 to 300. Within each call volume range (e.g., 201-300), operator cost is fixed. Across all ranges (0 - 300), operator cost is semi-variable. In business, the break-even point usually means the unit volume that balances total costs with total gains. For the analyst, Break-Even is the quantity Q for which cash outflows equal cash inflows, exactly. At the break-even quantity, therefore, net cash flow equals zero. The Simple break-even analysis finds Q by analyzing relationships between just three variables: fixed costs, variable costs, and cash inflows. The analyst must consider additional factors, however, when semi-variable costs or variable pricing are present. Note that business people also refer to a similar but different concept, the break-even point in time, or payback period.Payback period is the time necessary for investment returns to cover investment costs. Payback analysis does not consider units, but instead the timing of cash inflows and outflows. For more on the break-even point in time, see Payback period. Business people starting a new business need especially to understand both kinds of break-even points (break-even time and break-even unit volume). They must understand both because startups typically lose money for a while before becoming profitable. There is a limit, however, to the time owners can tolerate losses. Before launching a new business, therefore, they have a keen interest in knowing the break-even business volume. The new firm turns profitable only when business volume exceeds "break-even volume." A decision to launch the business may depend on the owners' view of the time and expense required to reach that volume. Sections below further define, describe and illustrate break-even analysis. Note that the term appears in context with related terms and concepts from the fields of business analysis, finance, and investment analysis. What is a break-even point analysis? How do you find a break-even point with a graphical solution? How do you calculate Break-Even with semi-variable cost figures?. How does break-even analysis change with variable pricing or other variable inflows? Payback period: The break-even point in time. See Payback Period. Introduction to financial metrics--cash flow metrics and financial statement metrics. See Financial Metrics. Simple Break-Even Analysis addresses questions of this kind: How many units must we sell to Break-Even? That is, How many units must we sell to bring total cash inflows equal to total cash outflows? The symbol for the answer is Q. The value of Q is the number of units that exactly balances cash inflows with cash outflows—the Break-Even point. For sellers, cash inflow per unit usually means the unit selling price per unit, with symbol P. As a result, analysts sometimes label this variable as revenues.The cash inflow total, therefore, is a function of unit volume. These costs are constant across all possible unit volumes. Example "fixed costs" include such things as equipment costs, floor space leasing costs, and executive staff salaries. The symbol F stands for Total fixed costs. The variable cost total varies by unit volume. Typical variable costs include per unit costs for such things as factory direct labor, materials, and sales commissions. Step 4. Calculate Breakeven Quantity Q with the Simple Breakeven Formula. 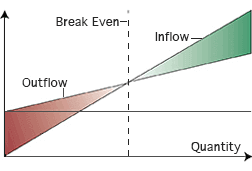 Knowing the break-even quantity Q, the analyst verifies the result by comparing total inflows to total outflows. Sometimes the break-even result includes a fractional unit (for example, 50.34 units). No one sells or ships fractional units, however. In such cases, of course, the analyst rounds break-even quantity Q up to the next whole unit (to 51 units). Break-even analysis focuses on net cash flow.In particular, the analyst tries to find a business volume that results in 0 net cash flow. Exhibit 1 shows the net cash flow result (solid black line) due to the different values of the input variables (selling price, fixed costs, variable costs, and unit volume). Exhibit 1. Simple break-even analysis. Here, three factors make this example "simple." Firstly, fixed costs are constant at $1,200 for all unit volumes. Secondly, the unit selling price is steady at $40. And, thirdly, total variable costs are proportional to unit volume. Variable cost per unit v is $15, and the total variable cost is the product of v and unit volume. As a result, the break-even quantity is 48 units. On the chart, break-even volume is the horizontal axis point where Net Cash Flow is 0. As unit volume increases, net cash flow climbs from negative to positive. And, as a result, break-even quantity Q is the unit volume where net cash flow crosses 0 on the horizontal axis. For working spreadsheet examples of the break-even equation and break-even graphs, as they appear above, see the Excel-based ebook Financial Metrics Pro. Naturally, break-even point Q does not exist for products selling at a loss. These products produce a negative gross margin because the unit cost of goods sold is higher than the unit selling price. There are in fact a few strategic reasons for selling one or a few products at a loss. Sellers may use a "loss leader," for example, simply to "get customers into the store," or to leverage sales of other products. And, they may sell at a loss to pursue rapid market share gains. Such products, however, always contribute a net loss to profits, regardless of volume. For working spreadsheet examples of the break-even equation and break-even graphs, as shown above, see Financial Metrics Pro. In the simple example above, the total variable cost is the product of unit volume and "unit cost." This approach is correct, because "unit cost" is constant across all unit volumes. The manufacturer's unit cost for raw materials depends on the size of the raw materials order. Direct labor costs per unit may depend somewhat on the size of the production run. Consequently, labor cost per unit differs for different volumes. Above a specific unit volume, a company may have to add more staff or production equipment. These additional costs may be "fixed costs" within a limited volume range, but across all such spans, they are semi-variable costs. Companies that want to achieve high unit volume may have to lower selling price, or offer volume discounts, or use pricing tiers for different order sizes. As a result, not all units sell at the same price. In this case, the result is semi-variable inflows. Under such conditions, the simple break-even equation is not accurate, or else it is accurate only within a limited range of unit volumes. Now, however, there is an additional semi-variable cost factor (sv). When production volume is 0 - 30 units, an additional $100 labor cost is required, making sv1 = $100. For volumes in the range 31-60 units, additional labor costs are $200 meaning that sv2 = $200. In the range 61-90 units, additional labor costs are $300 meaning that sv2 = $300. The image below summarizes this semi-variable cost factor. The most straightforward approach to calculating the break-even volume is to use the simple equation separately for each range. Consequently, total fixed costs in each range "i" are the sum of the given overall fixed cost (F) and the semi-variable cost for the span "svi." Total fixed cost for range i = F+svi. The next step is to find which spans, if any, contain a break-even point. Depending on the input figures, it is possible to have no ranges with a break-even point, or break-even in just one span, or break-even points multiple spans. When a unit volume range shows net cash flow negative at one point and positive at another, the range includes a break-even point. If net cash flow is negative throughout the range or positive throughout, the span does not include a break-even point. To test these two criteria for this example, we need only calculate net cash flow at the lower limit and upper limit. These two calculations suffice for calculating cash flow across each range is a linear function of unit volume. That is, net cash flow is a "straight-line" function. Range 1 has no break-even points because net cash flow is negative across the entire range. Range 2 has a break-even point because net cash flow is negative at the range lower limit (31 units) and positive at the upper limit (60 units). Within this range, therefore, semi-variable costs sv2 are constant and thus add into fixed costs, F. As a result, the analyst finds the Range 2 break-even point with the break-even formula Q = F/ ( P - v ), applying it to this range only. Range 3 does not have a break-even point because all unit volumes in the range show positive net cash flow. All unit volumes in the range are therefore above Break-Even. For more on semi-variable costs in break-even analysis, and working spreadsheet example, see Financial Metrics Pro. How Does Break-Even Analysis Change With Variable Inflows? The analysis in the examples above assumes constant cash inflow (or selling price, P) for each unit sold. However, in some situations, different customers pay different prices for the same goods or services. Seats on airline flights often sell at different prices. Airline ticket price may depend on such things as the class of service, advance purchase, demand for the day, or competitor's prices. And, sometimes, they offer only a few seats at discount prices. Consultants, physicians, and other professional service providers sometimes charge clients according to their willingness or ability to pay. Businesses that sell to other companies may negotiate prices individually with each customer. Companies launching new products or entering new markets may try out different pricing models from time to time. Break-even questions still have relevance in such cases. However, cash inflows that can vary from unit to unit call for an analysis that is more complex than the examples shown above. Secondly, set this cash inflow level as a target to reach for Break-Even. Thirdly, propose different pricing models and their resulting unit volume needs for reaching the target inflow.